When it comes to grilling, there are few things more frustrating than low heat or flames. We feel your pain! 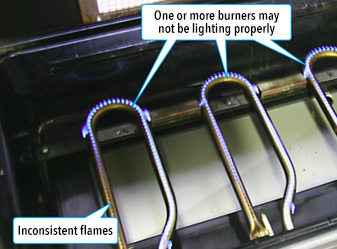 One of the most common questions we receive is about how to troubleshoot the pesky issues of low heat and low flames. Why Are The Flames On My BBQ Low? Every barbecue grill sold in North America has a safety mechanism in the regulator assembly called the Flow Limiting Device (FLD). This device is designed to limit the flow of gas when a leak is detected. Quite often, low heat or low flames are symptoms of having engaged the barbecue's Flow Limiting Device. In the absence of an actual leak, the most common way of engaging the FLD is to open the gas source when one or more of the control panel knobs are in the ON position. These actions mimic a gas leak and engage the safety device. To avoid triggering the FLD, you must always confirm that all control knobs are in the OFF position before opening the gas source. What Happens If I've Activated the Flow Limiting Device? Ensure that both the control knobs and the propane tank valve are in the OFF/CLOSED position. Disconnect the regulator from the propane tank. Turn all control knobs to the ON/OPEN position. Reconnect the regulator to the propane tank. Hand-tighten only ensuring you have a secure fit. Follow the regulator hose up to the point where it connects to the barbecue. Verify that the connection is not loose. You should not be able to unscrew it by hand. Turn the control knobs back to the OFF/CLOSED position. Slowly turn on the propane gas supply ¼ to ½ turn. Wait approximately five seconds for the gas pressure in the hose and regulator to stabilize. Turn ON/OPEN the selected burner control knob to the HIGH position and wait three to five seconds. Press/turn the ignition button or use a barbecue lighter to ignite the selected burner. If you are unsuccessful on the first try, repeat the process again. Ensure that both the control knobs and the natural gas supply valve are in the OFF/CLOSED position. Disconnect the natural gas supply hose by separating the quick connect assembly at the home connection. Turn all control knobs to the ON/OPEN position (HIGH/MAX). Reconnect the Natural Gas Supply hose by securing the Quick Connect assembly connection. Follow the natural gas hose up to the point where it connects to the barbecue. Verify that the connection is not loose. You should not be able to unscrew it by hand. Slowly turn ON the Natural Gas Supply valve to the ON/OPEN position. Wait approximately thirty seconds for the gas pressure in the hose and regulator to stabilize. If you find that your heat or flames are low, there's no need to rush out to buy a new barbecue. Chances are you've just tripped the FLD, and that's an easy thing to fix. You'll be back to grilling in no time!